WASHINGTON (AP) — After all this time running to lead America, Barack Obama and Mitt Romney are still trying to show they really believe in America. Both men have made the election not just about the economy or even the American Dream, but about America itself. They see a nation pessimistic about itself and nervous about its future, hardly American traits. They see political opportunity if they can come across as the one who gets what it means to be American, the guy who restores the glory. What's more, for reasons quietly tied to religion or race or family roots, Romney and Obama can never do enough to shore up their own American bona fides in voters' minds. This despite the fact that one of them will be the president next year, and one already is the president. In the midst of their patriotic push, Obama and Romney have never overtly accused the other of being un-American. But they spend no small amount of time raising doubts about the other's belief in America's promise, its workers, its resilience, its basic compact with its people. Both talk about the goodness of Americans and the exceptional nature of America itself. They rarely concede that the other candidate shares that view. Obama and Romney, a former Massachusetts governor, have vastly different visions on how to create jobs and opportunity, and that contrast in governing philosophy is a defining choice for voters in November. They often make it sound personal, too. 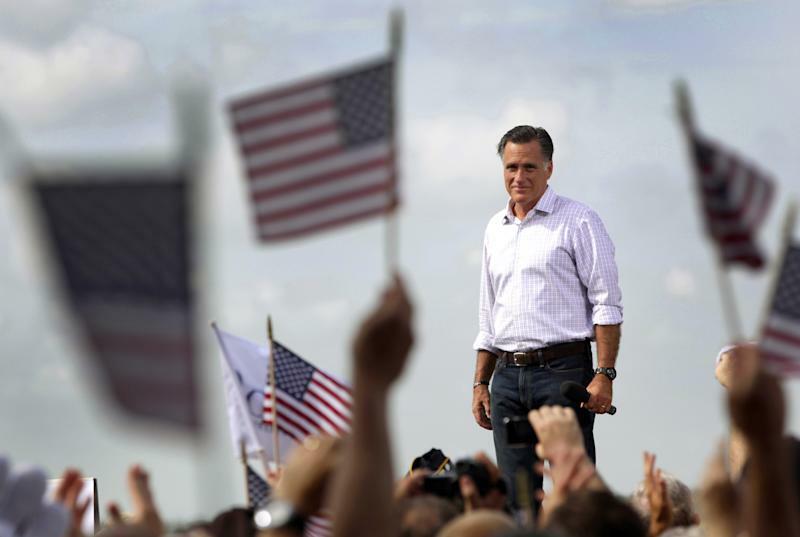 "I think this election will decide the soul of America," Romney said while campaigning for the Republican nomination April. "And I have a very different view of the soul of America." 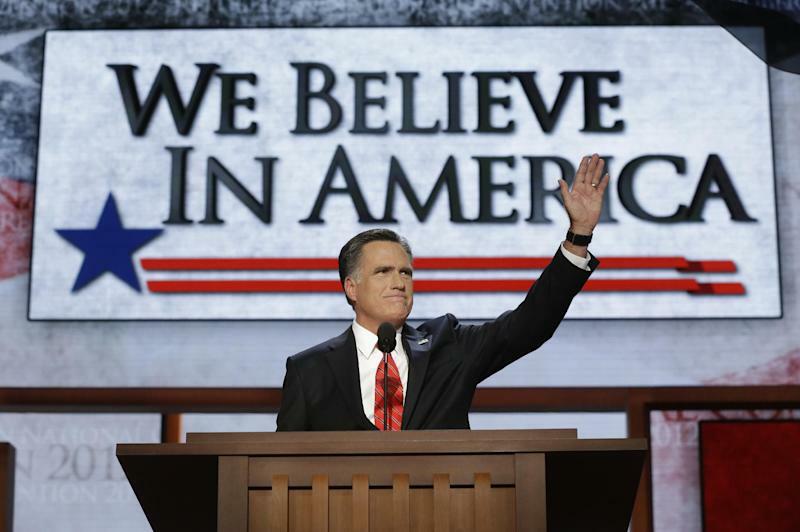 When Romney stood up at the GOP convention to accept the nomination, the theme of the night was on the giant screen behind him: "We Believe In America." The sentiment is on the side of his campaign plane, too. The suggestion is that the other party, led by Obama, does not believe in America, and that it's chiefly Obama. He flies on an airplane, Air Force One, with "United States of America" on its side. The believe part is implied. In Obama's acceptance speech at the Democratic convention, he framed the election as a choice of two visions. His was the one that would "restore the values" of America. The other vision he offered was of a Romney presidency that dismisses the role of citizenship; the one in which, for example, it would be OK for children to breathe toxic pollution in the name of corporate progress, he said. "You know what? That's not who we are," Obama said. "That's not what this country is about." There is something to this nagging sense that America has lost its way. Associated Press polling has not found a majority saying the nation is moving in the right direction since 2003. The richest nation on earth is divided over whether today's children will have a better standard of living than their parents do. When the national debt surpassed $16 trillion just days ago, Republican vice presidential nominee Paul Ryan held it up as indictment of Obama's leadership. "That's a country in decline," Ryan said. Vice President Joe Biden quickly turned those words back on him, working in a don't-you-doubt-America riff to his convention speech, and hitting that theme in campaign stops since. "America is not in decline," Biden boomed. "I've got news for Governor Romney and Congressman Ryan. It's never been a good bet to bet against the American people. Never." Obama, campaigning in Florida on Saturday, called the U.S. "a young nation with the greatest diversity of talent and ingenuity from every corner of the globe, so no matter what the naysayers may say for political reasons, no matter how dark they try to make everything look, there's not a country on Earth that wouldn't gladly trade places with the United States of America." While the values of policies and budgets they envision are part of the debate, Romney and Ryan have never actually bet against the American people. They are running to represent them. Romney has even gone so far as to sing "America the Beautiful" at events. The Obama campaign used it against him in a mocking ad about Romney's record on jobs and his taxes. On Saturday in Virginia Beach, Va., Romney recited the Pledge of Allegiance at a rally, going through it phrase by phrase to suggest Obama has fallen short of its promise. The candidates know the nation is divided politically, but not patriotically. Almost 90 percent of people called themselves "very patriotic" in a Pew Research Center poll in April. "Patriotism is very emotional. When people are scared — and essentially they're scared about where our country is going — they are prone to relate to that argument," said Barbara Perry, a senior fellow who studies the presidency at the University of Virginia's Miller Center. "Most Americans, whether liberal or conservative, fall into the patriotic category," she said, "because we all created this experiment of a country together." Romney and Obama have their personal reasons, too. The challenger is the first major party nominee to be a follower of the Mormon religion, which means he is subject to voter bias that hasn't budged much in decades in the United States. Nearly 20 percent of Americans say they would not vote for a well-qualified presidential candidate who happens to be a Mormon, a Gallup poll in June found. Many voters still aren't sure about Obama's faith, either. Just under half of registered voters in a Pew poll in June correctly identified him as Christian. Obama, of course, is the first president in U.S. history to dig up a long-form birth certificate just to prove he was born in America, and this was long after he had already been on the job. The notion that Obama was born anywhere other than in Hawaii has long been discredited, although Romney stirred it up again last month when he said "no one's ever asked to see my birth certificate." He later said he was joking. Associated Press Deputy Director of Polling Jennifer Agiesta and Associated Press writer Kasie Hunt contributed to this analysis. 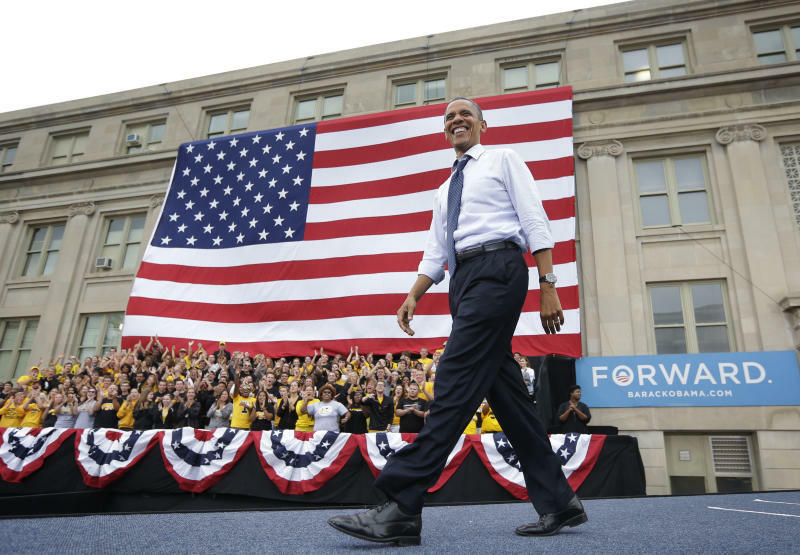 EDITOR'S NOTE — AP White House Correspondent Ben Feller has covered the presidencies of Barack Obama and George W. Bush.